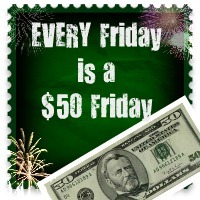 I love Fridays, because YOU could win $50! Can you believe Christmas is almost here? Are you finished with all your Christmas shopping? Well, how would you like an extra $50? If nothing else, you could use it to pamper yourself… you know YOU deserve it! How would you like a chance to win $50 EVERY FRIDAY? I am very happy to tell you that I have joined with an awesome group of bloggers to offer you a WEEKLY cash giveaway! Nice, yes? Here's some ever better news — the giveaway is only OPENED ONE DAY! (Closes Friday at Midnight) So you don't have to wait weeks to see if you won! This week's $50 Friday is for Facebook Likes – YOU MUST BE LOGGED INTO FACEBOOK AS A PERSON (not a page) then go down the list clicking "Like"
Here's what you need to do to ENTER – FOLLOW EVERY SINGLE BLOG ABOVE, just by clicking the LIKE Buttons, then move onto the entry form below, fill in BLOG BY DONNA in the extra info area, in question one, as the Blog you are entering on, then click "I did this"… for Question #2 (remember, you have to Follow EVERY Blog, via Facebook, above, before clicking "I Did This!" For another chance, enter Group B's Giveaway, by Clicking- HERE! 2 Responses to You know what I love about Fridays?